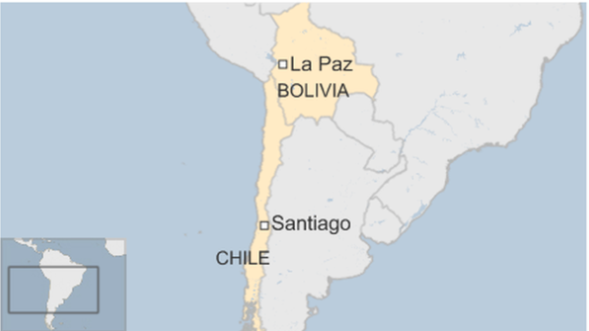 Bolivia’s President Evo Morales has accused neighbouring Chile of threatening his country by establishing a military base close to their border. 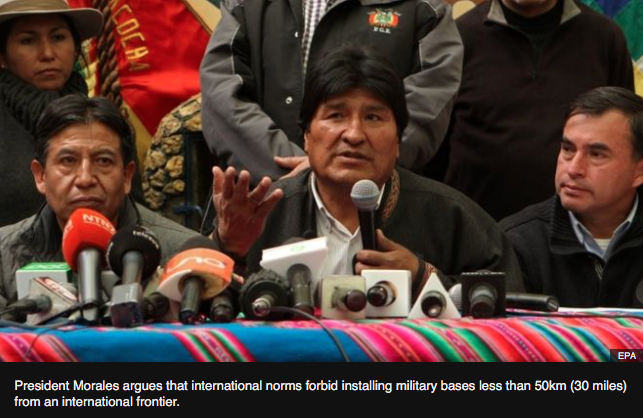 Mr Morales said the base about 15km (10 miles) from the border was an act of aggression against Bolivia. He said international norms prohibited military installations within 50km (30miles) from shared frontiers. Chile says it has stepped up military patrols but denies it has established a base. The statement said “the only military installation is in the area of Silala river on the Bolivian side only 1.5 km (one mile) in a straight line from the frontier from Chile. Both countries have been at loggerheads for years over access to the waters of the Silala river. The River Silala rises in Bolivia but flows down the Andes into Chile. President Morales said Bolivia would file a suit against Chile at the International Court of Justice (ICJ) over the issue of the river. Bolivia says it owns the Silala spring in a border region and that it is not being compensated by Chile for the use of its waters. But Chile says it is an international waterway of shared use. Bolivia had brought up another case against Chile at the Hague-based ICJ, demanding access to the Pacific Ocean. In 2013, La Paz took the century-old dispute with Chile over access to the Pacific Ocean to the court, which has yet to rule on the issue. Bolivia lost 400km (250 miles) of coast to Chile in a 19th Century war and has been landlocked ever since. This entry was posted in Bolivia, Business, Economics, Environment, Mining, Politics, Social Unrest and tagged 1879 Pacific war, Chile, invasion, public policy failures, water. Bookmark the permalink.